It doesn’t mean to say we haven’t been paddling at all. We did in fact spend 2 glorious days on the water whilst in California. 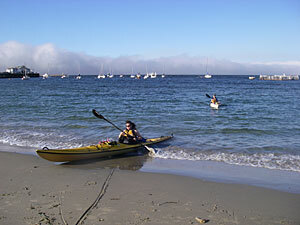 The first day was on Elkhorn Slough at Moss Landing near Monterey. This is a protected marshland reserve so there is no shortage of wildlife. We’d paddled there some 4 years ago, but there’s been a development since then. No, not the usual housing development, but the arrival of sea otters! It started with a few (allegedly) and then they invited their friends and now there are dozens of them. Considering the endangered status of these animals, it is quite a privilege to see a whole raft of males hanging out at the mouth of the Slough, or to watch mothers and pups playing throughout the reserve. And, of course, there were plenty of seals hauled up sunbathing. The conditions on the Slough were not what you might call challenging, which meant that all of one’s attention could be focused on the amazing wildlife and beautiful scenery. There were even some volunteer guides out in their kayaks ready to educate and inform other passing paddlers. I found this very useful as I realised I could not readily equate the birds I was seeing with their cousins back in Scotland. Just to prove that all our rescue training was not in vain, Alan performed a real-life T-rescue! And it wasn’t even with me. A sit-on-top boat had capsized and its 2 occupants were floundering helplessly in the middle of the Slough to the bewilderment (it seemed) of all present. Alan’s finely honed instincts immediately kicked in and he emptied their boat and got them back on board in a most expert manner. I was very proud of him. Two days later, we were back down the coast, this time in Monterey Bay itself with our dear friend and original teacher, Erin. Another perfect day was spent, in somewhat different conditions from the Slough. There was a stiff onshore breeze going on, but thankfully not much in the way of surf (haven’t done that class yet). It did make paddling without getting blown off course a little more challenging, but nonetheless fun with it. 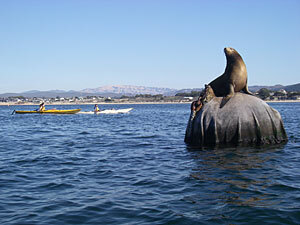 Once out of the harbour area, we paddled straight into prime sea lion territory. Indeed, they seemed quite delighted that we had entered their playground and proceeded to try to engage us in their frolicking and games. That’s when I noticed what large creatures they are. As two splashed down in front of Alan, soaking both of us, I began to imagine an inevitable capsize and was rather glad to have on a wetsuit. But it didn’t transpire and we emerged unscathed. 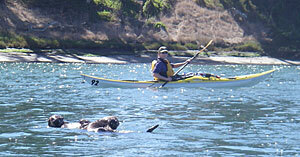 More sea otters ensued, incredibly close to our boats. A cuter animal you will not see – although, going by the crunching noises being emitted by one as he/she devoured some crustacean or other, I’m sure they can pack a fair bite. Not only is Erin a former kayaking instructor, but she graduated as a marine biologist (and is presently a paramedic firefighter – talk about multi skilled!). It was therefore wonderful to learn about the kelp forests and the critters in the bay direct from an expert. I was particularly appreciative of her paddling expertise as she ensured that Alan and I were orientated correctly in preparation for the wall of wake created by a large and speedy pleasure boat which was ploughing into the harbour. I doubt I would have seen it coming and would have potentially been swallowed up by it. So, it’s back to “auld claithes and purridge” in Scotland. We fully intend to return to the pool (sigh …) for more flailing about (if you’re me) on a Friday night just as soon as the car’s fixed. We might even venture into the sea, although it does look awfully cold and grey from here.